These are often called Snow Sedges. Dr. George Roemhild explained to me how he finds these winter caddisflies in February and March: "They crawl up on the snowbanks, but when the sun hits their dark wings they melt down out of sight. That's how I collect them, by walking along looking for holes in the snow." I will keep an eye out this winter and hopefully collect some specimens to photograph. 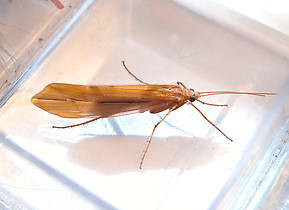 Female Psychoglypha alascensis (Snow Sedge) Caddisfly Adult View 3 PicturesThis specimen was 22 mm.